I try to live by the rule: if I can make it reasonably, then I try to avoid buying it. It isn’t a rule that never gets brother, but it makes me stop and think about the effort involved. This is especially so with bread, because I LOVE bread. So instead of buying it, I figure I should at the very least put some effort into it. I do not make it often, because the only thing worse than trying to avoid a nice loaf of store bread in the house is trying to avoid a nice fresh warm loaf of bread. Luckily I have friends and neighbors who help me consume the bread to make it easier. They are kind. I wanted something that verged away a bit from the savories (roasted garlic, rosemary, etc.) so I decided I would put my dried mangos and craisins to use and base the recipe off the basic bread recipe I use most often. In a large mixing bowl dissolve the sugar with the warm water and then add the yeast, give it a minute or two to make sure the yeast rises at this point, (if it doesn’t it won’t and you need new yeast). Once you’ve confirmed your yeast is good, add your salt, ginger, and olive oil and mix. Next add your flour about a ½ cup at a time and mix in, keep adding flour until it reaches a good dough consistency and no longer sticks to your hands. Removed from the bowl and kneed and then flatten like you are making pizza and add your fruits, roll the dough up and need the fruits in, folding and rolling. When your fruit is mixed in, cut your dough ball in half and roll each into a ball. Cover each ball with olive oil and roll it out into a football shape and place into a loaf pan that has been oiled and then sprinkled with cornmeal. Place a clean towel or cloth napkin over the pans and let sit in a warm place to rise for about 15 minutes. Boil water and pour into a shallow oven safe pan (a brownie pan or roasting pan will do) and place it on the bottom shelf of a cold oven. Place the loaf pans (without the towel/napkin) on the top shelf. Turn the oven on to 400 and let bake for about 40 minutes (the top should be golden brown). 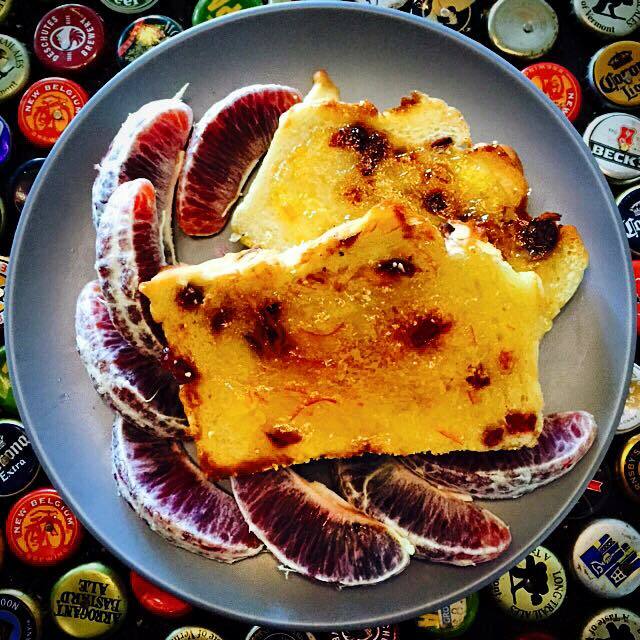 This bread is delicious warm, and even more delicious toasted with a little orange marmalade! Bucket List (Originally posted on Quornflour.wordpress.com). 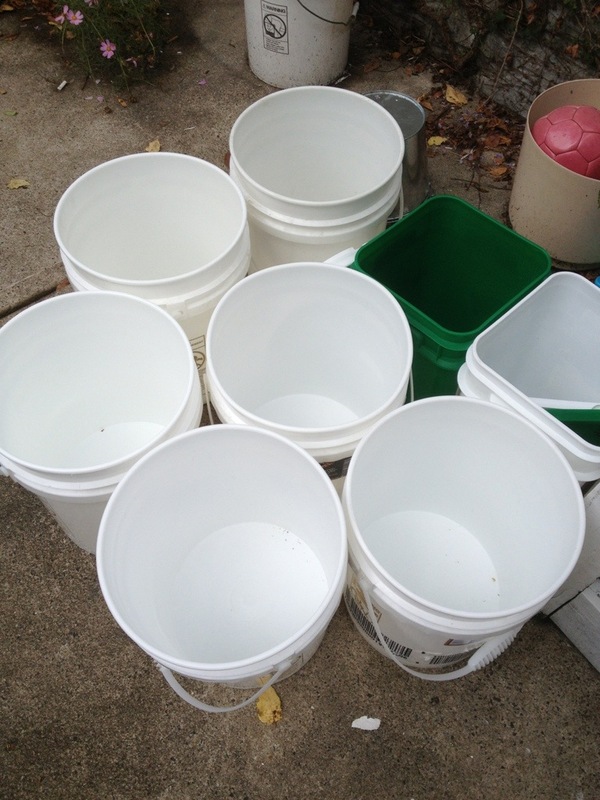 For an upcoming project I need some food safe, water tight buckets. I have a few buckets that I use for my recycling and dog food and kitchen laundry, which I figured I could use in a pinch, but first I figured I’d see about acquiring a few. Now you can get buckets from lots of restaurant and catering places that order large amounts of food supplies, especially pickles, croutons, protein powder and teriyaki. I have had the best luck acquiring buckets from sandwich shops. All you need to do is call (or stop in) and ask, now don’t do this during the lunch or dinner rush or they might stomp ya. It is a good idea to call first because a lot of places don’t keep around what they don’t need, so you might need to ask them to save them for you. A smaller place may go thru a bucket a week or so, so if you need multiple call around. Be sure to let them know if you need lids as sometimes they get separated. I have run into places that charge a small amount for their buckets, if it is a mom and pop type place I am ok with it, if it is a chain, forget about it! It is important to note that these buckets are plastic (not BPA free as far as I know), so they will most likely smell like whatever they were originally used for. Generally a little time in the sun will remove significant smells and over time the smell will dissipate, so keep this in mind and time things accordingly. I am super happy about my acquisition and after they sit outside for a day or two I will get some good use out of them! I took a few days off in November, then getting back to the swing of things I got a little busy and the result was a laps in blogging. But, that’s cool, because I was living! At first I had planned to blog while I was staycating, but then decided that it was best for my sanity if I just stay off the computer. So I did. It was a good week: I spent time with friends, shopping and sewing, and sewing and sewing. First I pieced a small quilt, which I need to finish up. Then I made some bags and some dog toys and put them in my etsy shop. It was a much needed break. When camping or traveling, add powdered milk to cereal, when ready to eat, just add water! As it turns out, I frequently take pictures of my coffee. Anyone who knows me also knows that I also take pictures of my food before I eat it. Apparently I take pictures of my coffee in various stages of consumption. Anyway, I am not a huge fan of “perfumed” or flavored coffees, however, recently my friend Sarah came back from Africa and with her brought some cinnamon sticks. Thinking of our coffee breaks one morning recently I dropped a cinnamon stick into the water of my percolator, it made the loveliest cinnamon flavored coffee. If you don’t have a percolator, soak the stick in a small amount of water and add it to the grinds of your drip maker, or add the water and the stick to your French press (you might have to halve it if it is big). It is a nice holiday coffee treat without all of the crap that goes into other flavoring. I am not sure why my brain associates quiche with fancy, but it does. Maybe because it is French? Are the French fancy? As a kid most of the French people I saw were the French Canadians on vacation. They stood out because they were the pale fat men on the beach wearing speedos. At any rate, I like quiche, and honestly, it is not all that terribly difficult to make, though I have had a few challenges when figuring it out… I feel like I have perfected the recipe now, which is not to say I will not ever change it. In a large frying pan add the rest of the butter melt it then add the spinach. The goal here is to reduce the water content in both, so you want to cook them hot but not too much, the spinach should still be bright and not brown when it is done. You can also spread it out on a place a dry it if you have challenges getting the water low before it over cooks. Next take your pie crust and put it in the bottom of your pie pan and pinch the edges to make it pretty. In a large mixing bowl, beat your eggs, add the milk, cream and black pepper and get everything nice and mixed in. Once it is all mixed together add the cheeses (I generally add the parmesan first, mix it in and then add the Swiss). Add your veggies. Mix it all together. Pour contents into the pie crust. Add one egg ½ a cup of milk, ½ cup of Swiss cheese to the base recipe above and cook it plain. Then serve it as a Quiche Bar, everyone can choose their toppings as they like.